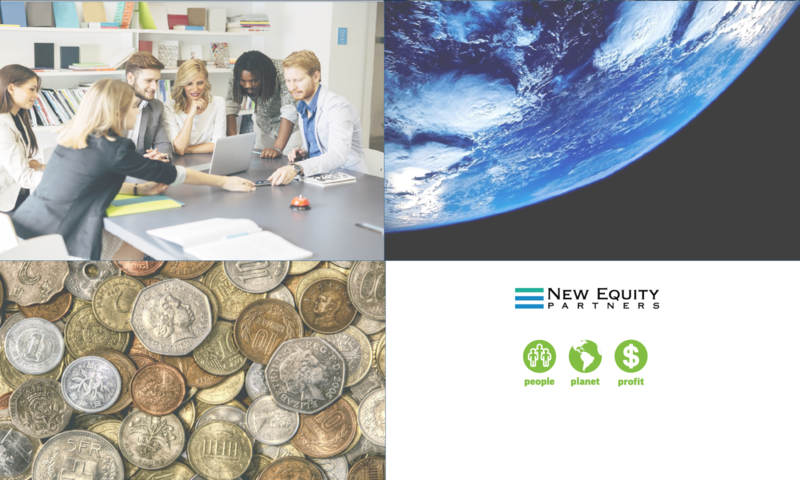 New Equity Partners are social entrepreneurs –self-starters who can envision and initiate changes to improve public and private services for the advantage of the entire community. A social entrepreneur finds new solutions to social challenges and ways to apply them on a large scale for benefiting many people. They have a knack for attracting the philanthropic and investment resources needed to do the job. Social entrepreneurs often focus on triple bottom line solutions that help people, protect the planet and produce profits. create new ventures that focus on the same triple bottom line principles that serve both theirs and the public’s interest. A Vermont L3C “public benefit” corporation that can offer private equity investments while seeking triple bottom line goals. NEP’s staff includes experienced senior management consultants and entrepreneurial leaders of private businesses, nonprofit organizations and civic enterprises. A cadre of full-time staff is supplemented by expert advisers to form and facilitate problem-solving teams with clients. * Triple bottom line solutions are results that help people, protect the planet and produce profits, all at the same time. They recognize the interdependence of problem-solving approaches with the array of solution options for attaining goals that are useful and productive for private and public enterprises. Roderick N. Petrey, Founder and principal at New Equity Partners and the former President of the Collins Center for Public Policy, a Miami-based Think Tank; retired Senior Counsel to Holland & Knight LLP; former president of the Florida Bar Foundation; and serves as general counsel for various public and private institutions. Rod was named “Floridian of the Year” by Florida Trend Magazine; chaired the “We Will Rebuild! Foundation” in South Florida following Hurricane Andrew; chairman of the Florida Justice Institute, Chairman of the Miami Museum of Science, senior adviser to the Council for Educational Change, and an active member of other civic and business organizations. A true social entrepreneur, Rod’s received many local, state and national awards for his distinguished community service and contributions. Dr. April Young, Principal at New Equity Partners – Dr. Young has worked extensively on questions of community change in urban areas. She designed the Overtown Men’s Health Study in Miami, Florida; led statewide efforts in juvenile justice reform, adult incarceration, and community re-entry; ran the Community-University Roundtables Project at Stanford University which initiated applied research and provided technical assistance in distressed California communities; serves as treasurer of the International Society on Men’s Health based in Vienna, Austria; provided policy analysis and technical assistance on federal housing grant programs to communities across the U.S. while with the social science research company Abt Associates in Cambridge, Massachusetts. She continues to conduct research and provide housing-related technical assistance to low-income communities. Dr. Young holds a Ph.D. in Social Anthropology from Harvard University, and an A.B. from Princeton University’s Woodrow Wilson School of Public and International Affairs. Daniel Bevarly, President of Public Communication Management Strategies – Dan’s professional experience spans local government and public administration, NFP organizations, and private business including: managing a national marketing program for deactivated ammunition plants for the US Army; developing cost-saving programs for state and local governments; a business development director for a public engagement software solution provider; and an early Gov 2.0 innovator. His specialty is public communication management, a technology management practice he coined that merges public affairs, civic engagement, communication and marketing, with the empowering collaborative technologies of social media. Anthony Balzebre, New Equity Partners – (Resident Millennium) Anthony’s professional experience includes working for the State of Rhode Island Office of Higher Education, monitoring legislation and education-related matters throughout the state; served as a Senior Project Manager at The Collins Center for Public Policy; founded and continues to serve as Vice President of the non-profit Bread for Bread, a charity dedicated to combating food insecurity in major municipalities. Anthony has special competencies in communications and social networking, designing outcomes-focused Internet and marketing and outreach strategies.